A wonderful French neoclassical pair of doré bronze and crystal swag urn and flame top sconces with 3 candelabra lights. A wonderful pair of French bronze neoclassical / Regency urn top and filigree sconces in the manner of Caldwell, stamped made in France on the backs. 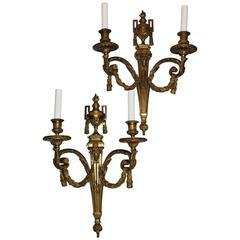 A pair of French bronze three arm neoclassical style wall sconces. Handsome pair of French sconces having three arms each, leaf motif and neoclassical lion's heads at the top of the wreaths. Electrified. The oval mirrors measure 9.25 x 7.5. A pair of neoclassical gilt bronze sconces. Pair of antique French bronze doré sconces, circa 1880.